August on ClassicHub – HubNut – celebrating the average! Well, there’s not much summer to shout about, but nonetheless, there’s a lot going on throughout August on ClassicHub. The Citroen Dyane has apparently received some new metal in critical areas, so is one step closer to an MOT and a road legal status it has lacked since 1995. I’m hoping to visit the car next week, and carry out some mild tinkering ahead of the all-important MOT pass. Once the V5 arrives (lost by the previous owner), I can get it taxed and set about the exciting business of trying to drive it home. 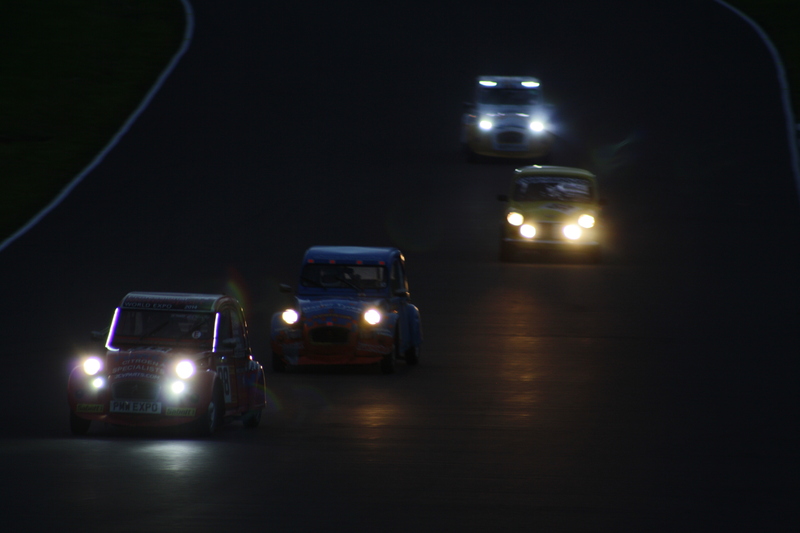 The 2014 2CV 24hr Race as night descended. My pic. Yes, that is a Mini. Alas, it seems unlikely that the Dyane will make it here before my Big Weekend. This is where I join Team Blueberry Muffins as part of the pit crew. Having attended the 2CV Racing 24hr Race for the first time last year, I’m afraid I’ve taken a serious interest. Not enough to want to drive – the thought of being amongst other drivers frankly just terrifies me – but the idea of helping to keep a Tin Snail buzzing away throughout a 24-hour race is very appealing. I’ll tell you more about team and car next time. It’s shaping up to be a great weekend, with a BMW-powered 2CV hopefully offering track demos, and dedicated ‘run what you brung’ track sessions and a track parade on the Saturday before the race starts. I’ve even been talking with one team about having a drive in a real 2CV racer at some point, so I can highlight the differences between those and the road going versions. They don’t roll for a start! It’ll be annoying to not have my own 2CV there though, because it’s the one car I’m perfectly happy to thrash! Speaking of which, Elly the 2CV has temporarily moved to another garage locally, so I have space to work on the Dyane. I fully expect my new project to have teething problems after so long on the road, and I also suspect it will prove utterly hopeless at keeping Welsh weather out. Garage space will be needed. 2CVs prepare for a track parade before the 24-hour race in 2014. Then there’s the XM. I’m hopeful that August will be the month where it finally gets the new suspension spheres it so badly needs. With the Dyane project incoming and funds tight, it may only get a rear end refresh at first. It really is rock hard on the rear, so it definitely needs doing. Away from Citroens, I’m afraid video production is likely to be a little lower than of late. I have a few on the burner, but am not sure when they’ll be finished. I also have to write words for people who very kindly pay me to do so. Life feels quite busy right now. Still, I’ve just enjoyed two days of camping in the Brecon Beacons with a group of family and friends that included four children all younger than five (one of whom was teething). That and man-flu has given me a good idea of how knackered I’ll feel 20-hours into the 24-hour 2CV Race! Parents, I once more salute you. 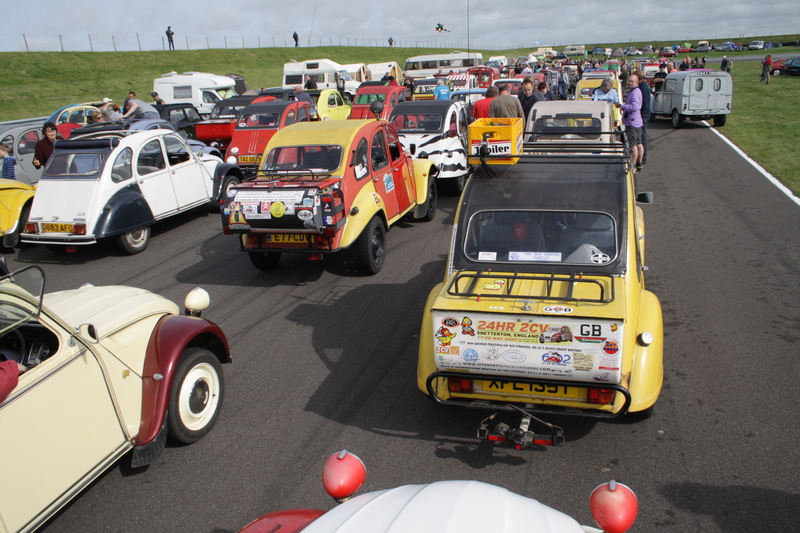 Good to see that you are fettling a Dyane……the best 2CV ever built. I love my 82 example which accompanies my V6 Xantia ( 450 quid bargain of the century) , last registered Xantia and CX. I started with a Dyane over 40 years ago and am lucky to have a good example for retirement. Could I ask about your recent comments on your XM V6 film…..I am trying hard to resist the charm of having an XM to accompany the CX…….how can it in your view be so much better than a V6 Xantia which in my view is an absolutely cracking car. ?….a real wolf in sheep’s clothing. It’s sad to think that the Xantia was the last fully hydraulic CIT ? I can’t entirely explain it, but the XM somehow feels more special. I drove XM and Xantia V6 back to back and liked both, but preferred the XM.